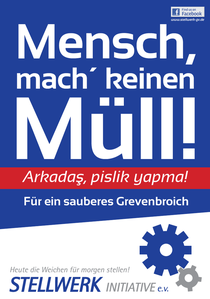 Ob in A4, A3 oder größer - wer unsere Müllvermeidungsaktion unterstützen will, kann das Plakat als PDF runterladen, ausdrucken und z.B. gut sichtbar ins Fenster hängen. Bitte nur in dieser Form verwenden und keine Abänderungen vornehmen. I visited many web pages except the audio feature for audio songs current at this web site is actually marvelous. I've been browsing online more than 3 hours today, yet I never found any interesting article like yours. It is pretty worth enough for me. In my view, if all website owners and bloggers made good content as you did, the net will be a lot more useful than ever before. I'm extremely inspired together with your writing skills and also with the format for your blog. Is that this a paid theme or did you customize it yourself? Anyway stay up the excellent high quality writing, it's uncommon to look a great blog like this one nowadays..